Most mechanical keyboards are pretty similar to one another. You have variance in switch type, in the aesthetics and certainly in quality and a handful of features, but beyond that the differences are relatively minor. The Gram Spectrum has a handful of these minor differentiators as well, but the most notable is in the keys themselves. Without a doubt the most interesting feature of this keyboard is that the keys have a lower in profile than most keyboards. It is still however, a mechanical keyboard. Tesoro calls this the Agile Mechanical Switch keyboard, with a focus on faster keystrokes that are still accurate. This is not the style of keyboard that is my personal preference, but there is absolutely a market for those who want a slimmer keyboard profile. One of my co-workers is a huge fan of laptop style keyboards, and has in the past purchased a few of these lower profile keyboards because he feels that he types faster on them. Still, he likes mechanical ones, and had never found a keyboard that marries those two properties terribly well. So, I walked the Gram Spectrum over to him and asked him to try it out for a few days and share his thoughts. The result was that I had to pry it out of his fingers when I came back for it as he stated it was easily his favourite keyboard ever. It is easy to understand why. There is still the tactile feeling with accurate actuation. I could find absolutely no flaws in the design or execution once I started to hammer away on this - and believe me, the way I type 'hammer away' is probably the most accurate description. My wife refers to me as a 'hard typer'. I learned to to key on an old standard as well as an electric typewriter where you actually had to hit the keys to make them register. When I am really going on a story or review article, my key presses are quite hard and audible, even on a standard non-mechanical keyboard. I tend to wear key type and etchings off rather quickly (especially on my left hand on the A, S and D keys) and have broken many a space bar. On top of the solid construction in this keyboard (which is still surprisingly lightweight), there is a nice additional feature with a detachable/breakaway type cable that makes it a bit easier to transport the keyboard should you wish to. Now while I haven't had the Gram Spectrum for months on end yet, I can say in the early testing it has held up without any issues. If that changes, I will update my review accordingly, but so far it has weathered my typing technique flawlessly and delivers a fast, accurate experience. I have talked a bit about the lower profile keys, which is obviously the primary feature that allows the Gram Spectrum to stand out from other mechanical keyboards, but I would like to touch on a handful of its other features. For one, if you enjoy backlit keyboards, especially those with customisable options, you will find a lot to like about this one. You have a full range of colours to choose from - in the millions with each key customisable via the included software. The keyboard is available in both black and white housing, and mine is the latter. The illumination is somewhat more pastel-like against the white, with a variety of different animation options such as breathing or wave effects. Those looking to the Gram Spectrum for gaming purposes should also appreciate that each key is customisable a 32bit processor and 512kb onboard memory for macro creation. The rollover options ensure that you won't have any ghosting, no matter how fast you are banging away on this thing. I type just over 100 words per minute, and never had any accuracy issues during my use of it. I tried this out on a variety of different games, from RTS titles that required multiple quick inputs to just playing more casually paced MMO's and creating macros to improve quality of life along the way. 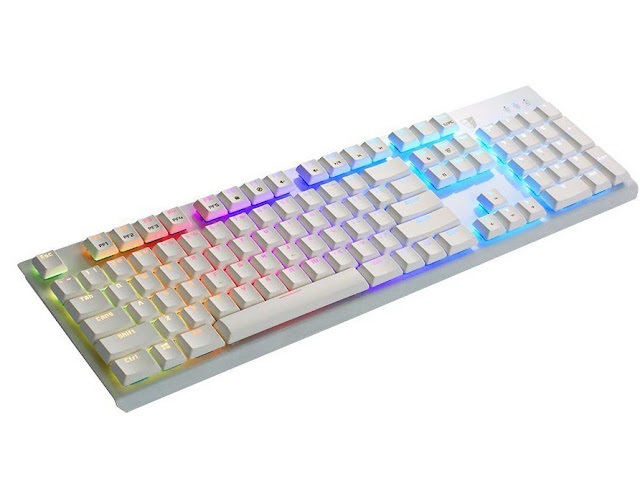 The gaming keyboard market is becoming a somewhat crowded one, and it can be a challenge for companies to innovate and separate themselves from the pack. The Gram Spectrum's lower profile and unique supporting switch mechanics allow for a slimmer laptop type feel with all of the functionality of a fully fledged gaming keyboard. It is a slick offering that provides the best of both worlds with no compromise.